Aurelio Salon in New Jersey offers a number of professional hair conditioning treatments to customers in our lather lounges or wash house at our Howell location. We invite you to try our New Kerasilk Luxury Hair Experience! Kerasilk is the new, revolutionary luxury hair care line that delivers long-lasting hair transformations providing beauty, strength and protection. Experience the in salon treatment Today! Read more about the product line here! Your Shampoo experience begins as you relax at our sinks. Our staff personalize your shampoo experience in our lather lounge. Guests can ask for different levels of massage pressure, location (You can ask to have us either spend more time on your scalp, neck, shoulders, or hands.) and water temperature. We make adjustments based on customer’s requests. We finish it off with a hot towel on your scalp. It’s OK if you decide to fall asleep during it, we wont tell anyone. If you are in a hurry you can request to have your shampoo and conditioning treatment done quickly. Our salons also offer Beauty Rituals. They are the sweetest lather lounge experience you will ever have. First we start with our Aurelio Salon Shampoo experience. Then we use Natural sugar enriched with moisturizing Oils to gently exfoliates dulling impurities from your hair and scalp, while easily dissolving with our special Perrier Sparkling Water rinse. 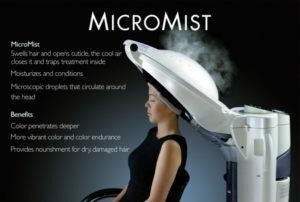 This pampering treatment leaves the scalp refreshed and energize. Ask about our Ultimate Hair Repair Service which is an intense spa treatment performed with state of the art Micro Mist Machine that repairs damaged hair. After 3 treatments your hair will feel like virgin hair again. The KeraTriplex Tx Repairs years of damage in minutes. It will reduces the breakage of your hair up to 80%, while improving the shine up to 35% and it helps prevent color fade up to 67%. Our Power Dose Treatment is a spa scalp treatment that also reconditions the hair. Read about the hair and beauty services we offer to women and men at Aurelio Salon on our menu. See what’s new at Aurelio Salon or learn more about us on our blog. Aurelio Salon gift cards are available in any denomination. Call Aurelio Salon and Spa in Howell at 732-303-0052 to learn more about the hair conditioning treatments available in our lather lounge. We are conveniently located near Jackson, Freehold, Brick, Manalapan, Marlboro, Wall or any other surrounding towns in Monmouth County or Ocean County NJ. We look forward to seeing you!